Keep your customers toasty in the chilly autumn months with a warm and enticing hot apple cider blend. When mixed with hot water, this brown powdered drink mix is quickly transformed into a delicious copper-brown hot cider beverage that your customers will love. This mix is incredibly easy to use, while still maintaining the old-fashioned balance and aromas of apples and cinnamon that cider-lovers have come to know and expect. You can add even more spice to this ready-to-use mix by adding cinnamon sticks or a dollop of whipped cream drizzled with caramel for a memorable flavor and presentation. The perfect addition to any establishment, this hot cider drink mix is sure to please patrons at your coffee shop, restaurant, concession stand, or bed & breakfast! I purchased this product in the fall. A great addition to our fall menu. Great taste and easy to prepare. Nice margins on this item. This spices apple cider mix is perfect for the fall season. For our purposes we used two packs to have just the right amount of sweetness. Nothing extra is needed besides hot water which makes this very easy to make and serve. This apple cider is good both hot and cold. Has a nice apple spice taste and is really easy to prepare no matter how you prefer it. Hot apple cider flavored with spices that bring thoughts of cool autumn evenings. These handy portion packs make this delicious treat quick and easy to make. They're the perfect offering for your buffet, cafeteria, or even on your own table. Anytime is the perfect time for this sweet, tasty treat. Hot spiced cider brings thoughts of falling leaves and autumn splendor. In this single portion pack, it's easy to mix a cup, sit back, close your eyes and you can have autumn anytime. Perfect in coffee houses, break rooms, breakfast bars, or even at home, hot spiced cider is the perfect blend of sweet and spice on a fresh fall day. This is a great apple cider! With such a low price you can really make some money on this item. Everyone loves apple cider during the holidays! This apple cider has an amazing flavor for all year long! It's a generous amount in the box and is sure to delight in any situation! This spiced apple cider has a nice flavor, and the individual serving packets make them easy to use. My only complaint is the high amount of sugar per serving, but that is pretty common. These have a great fresh apple taste with just the right amount of spice. We add caramel to them and the customers love to orde these. Im torn on this one. Its not bad.. my daughter loves it cold.. Personally im just not a huge "spiced" fan... I have tried it with a splash of alcohol and it is nice that way.. I don't know that i would purchase again, but for the price and what it is, it really isnt bad at all. 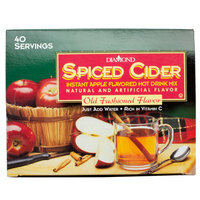 This forty count box of Spiced Apple Cider Hot Drink is delicious. The flavor is a great combination of apples and cinnamon and the spice level is “kid-approved”. I would highly recommend this hot cider and hope for additional flavors available in the future..
A nice dry apple cider mix- just add water! This is a must have for the Fall season and great for curling up with a cup of this by the fire! Great addition to our menu. Great flavor and our customers love it. Fall or summer this flavor works for us. Very happy with purchase. Weill buy again. Good product. Tastes exactly like many of the store brands. Perhaps a bit more sugary than some, but not bad. It was a nice addition to our winter menu. We offered this hot apple cider along with the hot teas and hot coco. I was surprised at how popular this hot apple cider was, Several people commented how it. was a nice change from the regular coffees and teas. I also found that many people have never had hot cider so it was something new for them to even try for the first time.. These dink mix pouches are great for taking to work in the winter. Easy to just add water, stir and serve. Taste is great, like mulled cider. My children loves the Spiced Apple Cider Hot Drink portion Packs! This is a cozy fall and winter drink. Sometimes we add the Torani Salted Caramel Syrup to make a caramel apple cider drink. These spiced apple cider packets are great for hot toddies! They are quick and easy to use and we don't have to keep around an expensive bottle of apple cider. My kids love hot apple cider in the morning. It is hard to find and often very expensive. I am so happy I found it on your site. Thanks for the great products!! I love this apple cider. Perfect time to buy now before the weather gets warmer. Great on a cold night watching a movie with a loved one. This product is amazing! Very easy to prepare and great feedbacks about taste from customers! I'm about to give new order soon! Don't miss this one! Delicious and easy to make! These packets of spiced apple cider will have even the pickiest cider drinker thinking its the real deal. Great stuff. HOT Spiced Apple Cider is perfect for the winter and people love the flavor. We mix one pouch in about 12 ounces of hot water. This spiced apple cider hot drink mix is especially good on a cold night. Caramel flavoring is a wonderful accompaniment for this spiced hot cider. This is a very good apple cider. Very delicious for cold autumn mornings. Actually, you can enjoy this awesome drink all day. I certainly can! Ahhh, the taste of fall. This spiced apple cider is delicious. The portion size is great and the price is a great deal for a box of 40. SOOO YUMMY. We buy this for home use.... Let's be honest... It really gets expensive going to the coffee stand for the SAME exact thing at 10X the cost of making it yourself at home. Pair this with some disposable cups and you are on your way to saving a ton of money.... and not sacrificing any cider!!! This is a decent Spiced Apple Cider Mix. It needed to be doctored up a bit to make the flavor to our liking, but overall you get what you get when ordering individual apple cider packages. They are very easy to use and our customers seem to enjoy them as well. We just started using this brand but so far our customers are loving it. We've used another brand for years but it was discontinued last year. We've had a couple folks say was that it's a little too sweet, but the majority really like it. I love these Apple cider packs! They're perfect if you want something sweet and tangy. They're good for a cold drink or hot and even better with a cinnamon stick! This apple cider drink mix has increased our drink sales in the winter. It has a good taste and Our customers that do buy it comeback on a regular bases. i find this cider mix to be as good as any I have tried. it is sweet but not too too sweet that its unbearable. We order a lot of apple cider, this brand being one of them, but like some other reviewers it is a little bit on the sweet side. However, it is packed with flavor. My customers kept asking for Apple cider when October rolled around and I began searching for a great tasting mix. I hit the jackpot when I purchased this product. Great taste. Not extremely sweet but you can also add an extra packet if you're looking for some added sweetness. Has a nice aroma and wonderful flavor. I love hot apple cider and cannot wait to try this product, it came in within the dates listed. The only downside was that the box was pretty mangled so I'll have to find something else to put the packets in. This product was sickeningly sweet. Couldn't even finish half a cup. I would not recommend buying this product, it has more sugar than a soda. We appreciate your review, David! If you are looking for a product that would better meet your expectations, please contact our Customer Solutions team. This is a very good and inexpensive product, just as good as fresh cider. Enjoyable warm or cold with just the right amount of spice. Spiced Cider is a great drink option to offer customers with dessert. This drink mix is easy to make and very cost effective. A perfect pairing with apple pie. Great spicy flavor, you really get the apples and cinnamon. It truly reminds me of fall when I am drinking this spiced cider hot drink. Whats better for the holidays, then hot spiced cider!!! This is a great value pack that easily makes hot cider! Great flavor!! Great for ringing in the new year too!! !